The Town of Westbrook once again needs heroes! Foul denizens of the South Forest have been encroaching on the town. The murder of several hunters and the kidnapping of two children have at last brought the situation to the forefront of the town master's attention. He has issued a decree that the South Forest must be tamed, and he needs heroes to help! * Three full-length adventues take characrter deep into the forest! * Three additional, smaller lairs provide even more adventure! * New Open Game Content and player handouts enhance your game! 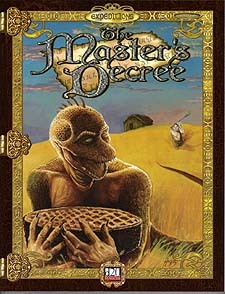 The adventures in The Master's Decree are written for a balanced party of from 4-6, 3rd to 5th level adventurers. They continue the story, started in Beginnings: Westbrook, of the coming very powerful merchant's guild to the small town of Westbrook. Requires the use of the Dungeons & Dragons Player's Handbook, Third Edition. This product utilizes updated material from the v.3.5 revision.